What do Phish and Insane Clown Posse have in common? A whole lot more than you might think, especially if you ask Nathan Rabin, who spent the better part of two years following these groups and attempting find out what makes them simultaneously cherished and reviled by so many people. From The Gathering of the Juggalos to Phish’s Super Ball IX, Rabin got his hands (and head) dirty as he suddenly found himself appreciating these seemingly disparate bands while teetering on the brink of a complete emotional breakdown. The premise of You Don’t Know Me But You Don’t Like Me could be the basis for a pretty interesting sociology thesis. But Rabin is a writer for The Onion and wisely decided to completely immerse himself in the communities of these two bands, happily gobbling up every illicit substance handed to him and embracing the love and wonder of his new environments. The result is a fast-moving, often hilarious account of why some people can’t live without these bands. Rabin, who grew up listening to hip hop and never got into Phish before this experiment, eloquently describes the experience of following the band that any devoted live music junkie will immediately relate to. It’s amazing how quickly Rabin gets bit by the bug that has driven thousands to make a band their #1 priority. The chapters focusing on ICP take us deep into the “Dark Carnival” and offer one of the most fascinating pieces of investigative journalism of the past year. Although I would never want to attend The Gathering of the Juggalos (even more so after reading about the infamous “Hepatitis Lake” of the festival), Rabin’s accounts of the event are truly mesmerizing. Rabin’s comedic tone jumps off the page, while also offering some poignant passages about the love that inspired his psychotic social experiment. 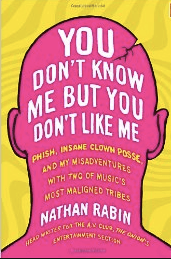 The book is just as much about Rabin’s experience as a fan (or phan) as it is a study of the social phenomenons of Phish and ICP. The snappy prose makes for a quick read, but the sentiments expressed by Rabin stay with you long after you finish the last page. The book just came out on June 11, and I haven’t seen it in bookstores yet, but it’s on Amazon for a great price.